Note: I’m taking a few days off, so I’ll be republishing some of my favorite pieces from earlier in this blog’s run. This post originally appeared, in a slightly different form, on November 2, 2016. But, you may well ask, isn’t the cutting edge a place only for geniuses? No, fortunately. Work accomplished on the frontier defines genius, not just getting there. In fact, both accomplishments along the frontier and the final eureka moment are achieved more by entrepreneurship and hard work than by native intelligence. This is so much the case that in most fields most of the time, extreme brightness may be a detriment. It has occurred to me, after meeting so many successful researchers in so many disciplines, that the ideal scientist is smart only to an intermediate degree: bright enough to see what can be done but not so bright as to become bored doing it. What, then, of certified geniuses whose IQs exceed 140, and are as high as 180 or more? Aren’t they the ones who produce the new groundbreaking ideas? I’m sure some do very well in science, but let me suggest that perhaps, instead, many of the IQ-brightest join societies like Mensa and work as auditors and tax consultants. Why should the rule of optimum medium brightness hold? (And I admit this perception of mine is only speculative.) One reason could be that IQ geniuses have it too easy in their early training. They don’t have to sweat the science courses they take in college. They find little reward in the necessarily tedious chores of data-gathering and analysis. They choose not to take the hard roads to the frontier, over which the rest of us, the lesser intellectual toilers, must travel. You wonder…why it is that Mycroft does not use his powers for detective work. He is incapable of it…I said that he was my superior in observation and deduction. If the art of the detective began and ended in reasoning from an armchair, my brother would be the greatest criminal agent that ever lived. But he has no ambition and no energy. He will not even go out of his way to verify his own solution, and would rather be considered wrong than take the trouble to prove himself right. Mycroft wasn’t wrong, either. He seems to have lived a very comfortable life. But it’s revealing that Conan Doyle gave the real adventures to the brother with the slightly less scintillating intelligence. In art, just as in science, technical facility can prevent certain artists from making real discoveries. The ones who have to work at it are more likely to find something real. But we can also raise a glass to Mycroft, Marilyn, and the geniuses who are smart enough not to make it too hard on themselves. It is hard to believe that Holmes, who had so close a grip on realities, could ever have taken much interest in the pettiness of party politics, nor could so strong an individualist have anything but contempt for the equalitarian ideals of much modern sociological theory. It is perfectly true that the clash of political opinions and of political parties does not seem to have aroused great interest in Holmes’s mind. But, fundamentally, there can be no doubt that Holmes believed in democracy and progress. 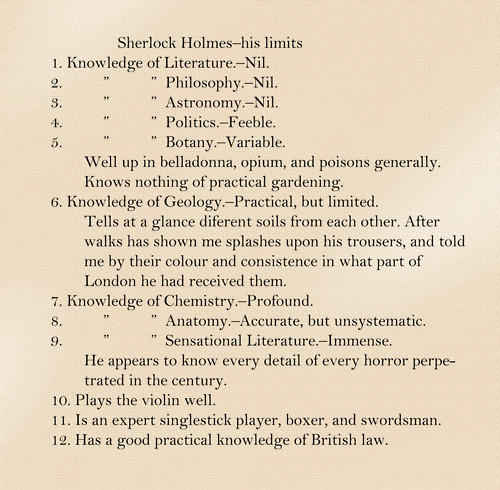 Holmes’s knowledge of politics was anything but weak or partial. Of the hurly-burly of the machines, the petty trade for office and advantage, it is perhaps true that Holmes knew little. But of politics on the highest level, in the grand manner, particularly international politics, no one was better informed. I can barely stand to look at a newspaper these days, so it’s tempting to take a page from Holmes and ignore “the petty trade for office and advantage.” And I often do. But deep down, it implies an acceptance of the way things are now. And it seems a little feeble. Note: Spoilers follow for the season finale of Hannibal. In The Silence of the Lambs, Crawford says that Graham’s face “looks like damned Picasso drew it.” None of the prior cinematic versions of this story have dared to follow through on this climax, but I have a feeling, given the evidence, that Fuller would embrace it. Taking Hugh Dancy’s face away, or making it hard for it look at, would be the ultimate rupture between the series and its viewers. Given the show’s cancellation, it may well end up being the very last thing we see. It would be a grim note on which to end. But it’s nothing that this series hasn’t taught us to expect. This wasn’t the hardest prediction in the world to make. One of the most distinctive aspects of Bryan Fuller’s take on the Lecter saga is his willingness to pursue elements of the original novels that other adaptations have avoided, and the denouement of Red Dragon—with Will lying alone, disfigured, and mute in the hospital—is a downer ending that no other version of this story has been willing to touch. Of course, that wasn’t what we got here, either. Instead of Will in his hospital bed, brooding silently on the indifference of the natural world to murder, we got a hysterical ballet of death, with Will and Hannibal teaming up to dispatch Dolarhyde like the water buffalo at the end of Apocalypse Now, followed by an operatic plunge over the edge of a cliff, with our two star-crossed lovers locked literally in each other’s arms. And it was a worthy finale for a series that has seemed increasingly indifferent to anything but that unholy love story. The details of Lecter’s escape from prison are wildly implausible, and whatever plan they reflect is hilariously undercooked, even for someone like Jack Crawford, who increasingly seems like the world’s worst FBI agent in charge. Hannibal has never been particularly interested its procedural elements, and its final season took that contempt to its final, ludicrous extreme. In the novel Red Dragon, Will, despite his demons, is a competent, inspired investigator, and he’s on the verge of apprehending Dolaryhyde through his own smarts when his quarry turns the tables. In Fuller’s version, unless I missed something along the way, Will doesn’t make a single useful deduction or take any meaningful action that isn’t the result of being manipulated by Hannibal or Jack. He’s a puppet, and dangerously close to what TV Tropes has called a Woobie: a character whom we enjoy seeing tortured so we can wish the pain away. And there are times when Hannibal, the show, plays as if Lecter had gotten an executive producer credit sometime between the second and third seasons. If anything, this is a testament to his vividness: when properly acted and written, he dominates his stories to a greater extent than any fictional character since Sherlock Holmes. 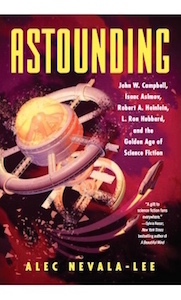 (In fact, the literary agent hypothesis—in which the credited writer of a series is alleged to be simply serving as a front—originated among fans of Conan Doyle, who often seemed bewildered by the secondary lives his characters assumed.) But there’s something unsettling about how Lecter inevitably takes on the role of a hero. My favorite stretch of Hannibal was the back half of the second season, which looked unflinchingly at Lecter’s true nature as a villain, cannibal, and destroyer of lives. When he left the entire supporting cast to bleed slowly to death at the end of “Mizumono,” it seemed impossible to regard him as an appealing figure ever again. And yet here we are, with an ending that came across as the ultimate act of fan service in a show that has never been shy about appealing to its dwindling circle of devotees. I can’t exactly blame it for this, especially because the slow dance of seduction between Will and Hannibal has always been a source of sick, irresistible fascination. But we’re as far ever from an adaptation that would force us to honestly confront why we’re so attached to a man who eats other people, or why we root for him to triumph over lesser monsters who make the mistake of not being so rich, cultured, or amusing. Lecter came into this season like a lion, but he went out, as always, like a lamb.